The very first known instance of the word maple (though, at the time it was “mapul”) was in Chaucer’s The Knight’s Tale in Canterbury Tales where it is just part of a list of all the trees in the woods. Maple trees (genus: Acer, Latin for sharp, as in the points of the leaves — related to the base word for “acerbic), are all over the northern hemisphere, and are one of the foliage trees that bring the leaf peppers up to New Hampshire, Vermont, Ontario and Quebec. But for all that, as pretty as a maple can be in full autumnal bloom, the real genius of the genus maple is the sugar maple that brings us this glorious Maple Weekend in New Hampshire. Knowledge of the hidden treasure in the maple tree predates European settlement on the North American continent — French explorer Jacques Cartier mentions the trees in a 1540 report, and mentions of the “distilled sap” are found by 1606 in the writings of Canadian explorers. It seems, though, that the native people of these areas mostly went beyond syrup to sugar, which makes sense, as anyone who’s tried to take gifts of maple syrup home on a plane could attest. Maple sugar is much easier to transport, being dry and compact. The process of making syrup and sugar from maple sap pretty much boil down to the same thing — the removal of water from the sap. Accounts vary on exactly how much sap is needed to make syrup, but it’s something around 40 gallons of sap boiling down to a gallon of syrup. Concentrate it down to dry sugar and you can see why maple sugar has a rather high price tag. But it didn’t always. Maple sugar was promoted by abolitionists as a great local alternative to slave-produced cane sugar. (Does this particular line of reasoning strike anyone else as rather modern? 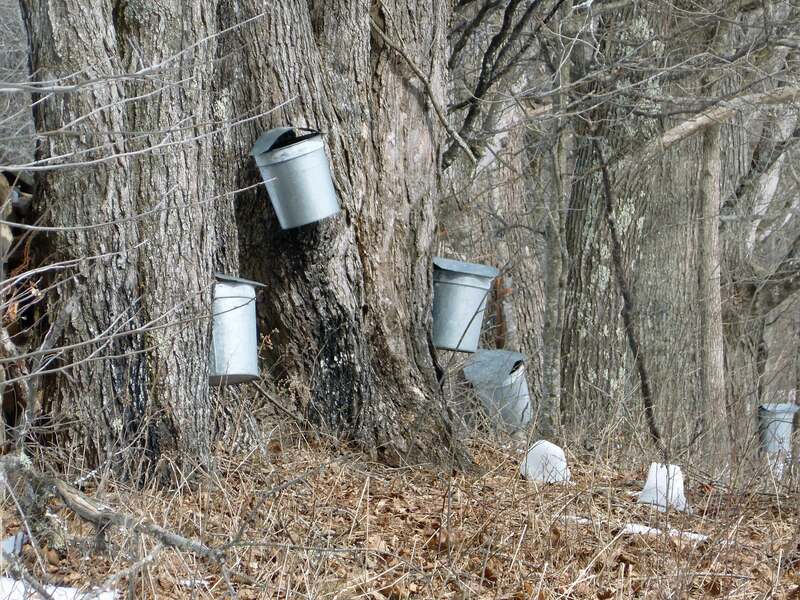 The more things change…) When cane sugar was taxed as an import, maple sugar and cane sugar were about the same price, but by the end of the 19th century, producers in New England were producing primarily syrup, not sugar, from their maple sap. Over the years, technology has refined the processing of maple, with the current high-end technology being reverse osmosis — the removal of about 75% of the water from the sap before it is boiled into syrup, reducing the processing time considerably. 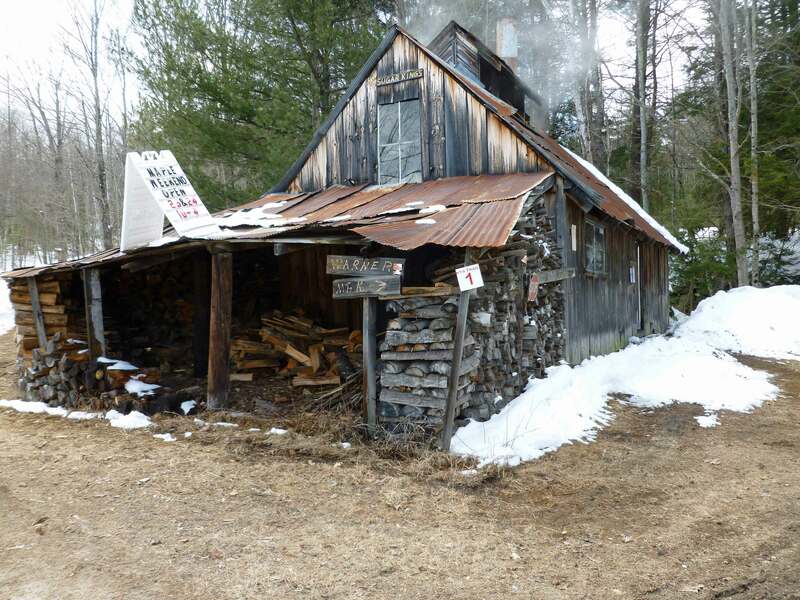 Some sugar shacks are running r.o., but not all of them. The one we visited was doing it old school, just wood fire and long boiling. All the technology in the world can’t make the weather behave, though, and 2012, which was remarkably warm, was a bad year for maple syrup production, reducing output everywhere but Maine. New Hampshire still produced 76,000 gallons of maple syrup, but that was down from 120,000 gallons in 2011. Can you imagine 120,000 gallons of maple syrup? Are you imagining a giant vat of syrup right now? I am. 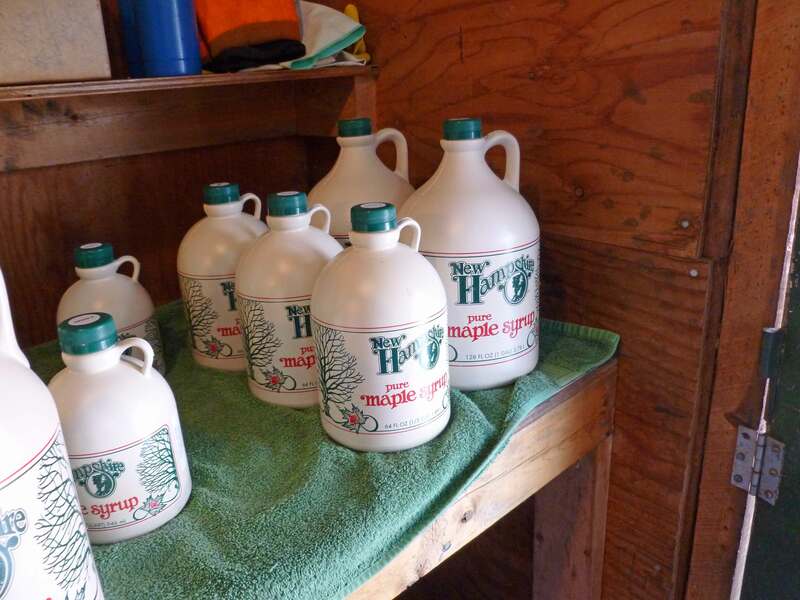 Apparently, though, this weather’s been pretty great for maple sap, so we were promised a good Maple Weekend. Denise and I drove out to Warner to the Courser Farm Sugar Shack, which has apparently been open since 1957. Have you ever been to a sugar shack? It’s a fun winter experience — they really are shacks, with all the ventilation that the word implies, and specifically chimneys and vents up top. You can see a working shack as you approach — the steam and smoke give them away. 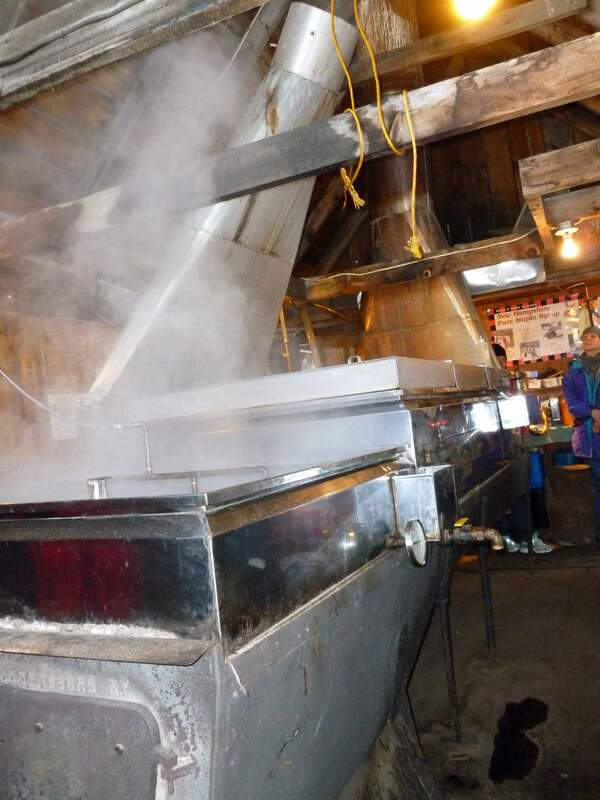 Inside, they are remarkably cozy, especially on Maple Weekend — you’ll likely be handed a small cup with a shot of syrup in it, still warm, as you enter. The owners and likely a neighbor or two will be hanging out and chatting, keeping the fires going, watching the sap become syrup. They smell pretty amazing, too — sweet, though not quite syrupy, tinged with wood smoke. Maple syrup is graded — both by color and letter. Syrup gets darker as the season goes on (from light to medium to dark amber) and grade B is the end of the season, recommended mostly for cooking. If you want to visit a sugar shack, and you live in the northern tier of North America, look at your local agricultural department’s website. So far as I can tell from a quick search, you can get locally-made maple syrup as far west as Wisconsin, as well as all over New England. So you’ve got your syrup. What do you do with it now? Maple syrup is a common liquid sweetener in vegan baking and cooking, making a good substitute for honey. If you’re feeling really industrious, try making maple cream from your syrup. It’s labor-intensive, but if you’ve never had it? It will blow your mind. Honestly, though, I think it’s best straight up over pancakes or waffles. I will warn, though, that it’s addictive — once you’ve gone to pure maple syrup rather than “pancake syrup,” you will be hard-pressed to go back. Try it out with Denise’s recipes for gluten-free pancakes and waffles! 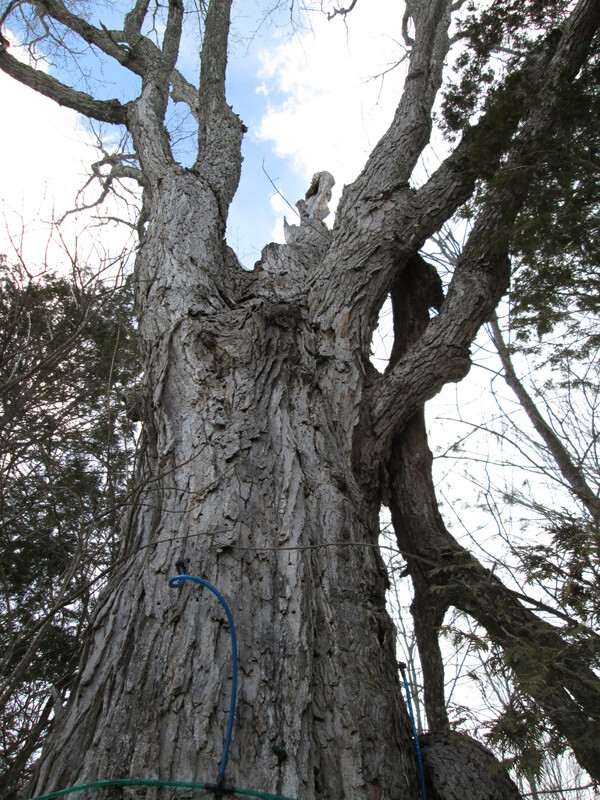 Want to learn how to tap a tree in your backyard? Start here.